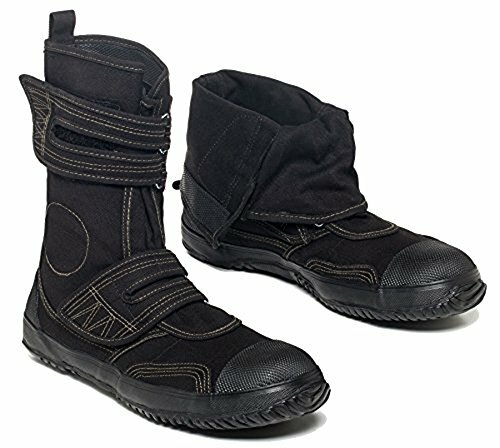 FUGU industrial boots have been established as the most durable and sturdy boots in the Japanese market over the years. However, even though they were originally designed for the Japanese workforce, through the last years are considered one of the hottest fashion statements! Our canvas boots are constructed with eco-friendly materials - ideal for those of you who vegetarian, environmentally conscious or even just prefer the natural choice! Their futuristic style is ideal for every kind of occasion; our amazing pair of shoes is going to match your clothes? collection perfectly; upgrade your style now! We know style- get our product now and feel the difference! Are you running late every morning because you have to put on your inconvenient shoes? We have a suggestion to make- we have something that might change your everyday life dramatically! Get our vegetarian shoes now and put them effortlessly, without hassle- just let your foot slip inside the shoe! Our product features a double-Velcro technology and an Iron Dome steel toe in order to support and protect your feet and toes. With their Water Resistant and Water Repellent Treatment they can be worn for all around use! - indulge yourself into that life-changing shoe experience! Our hiking boots come out at a wide range of sizes- choose yours now! FEEL GOOD ABOUT YOUR FASHION: If you're looking for a more eco-friendly alternative to leather or synthetics, we've got what you want. Built with no animal products, woven with fabric and shod in rubber, these boots can be embraced by anyone looking for more sustainability in their wardrobe choices. Fugu supports the VEGAN Choice in all our collections. LIGHT, DURABLE, ANYTIME, ANYWHERE: Slim and close-fitting, these tall mid calf boots can fold down to accessorize your outfit as you please, along with almost infinitely adjustable straps to accommodate a wide calf on down. They're light enough to wear in warm weather, and layer with thermal socks to easily handle the cold. They make a great gift for the cosplay person in your life. Plus, we offer a free size exchange if the pair you choose isn't a perfect fit! If you have any questions about this product by fugu, contact us by completing and submitting the form below. If you are looking for a specif part number, please include it with your message.